- SingulArch pocket is an application for PPCs. - It was designed for the collection of all kinds of data at archaeological excavations. It can be used by geologists, biologists and other fieldworkers as well as for any other purpose of collecting data and coordinates. - SingulArch-Pocket contains a CAD-Tool, which is able to interpret GPS-data. You can display bitmaps and your vectordata as well. - Since version 1.3 data fom external devices (e.g. totalstations) can be recieved and sent to (control e.g. your Geodimeter-totalstation via SingulArch (ask for other models)). - The light-version is for users, who want to work with the CAD-tool, coordinates and GPS only. Main parts of the database functionality are disabled in the light-version (also the possibility of connecting other serial devices, like totalstations). - Users of the full-version get a CD-Rom with SingulArch-Sync also, so they are able to synchronize Pocket- and Desktop-projects. All forms of the database are enabled. - Since version 1.1 SingulArch is able to interpret GPS-data. - Since version 1.2 (geo-)referenced bitmaps can be displayed in the CAD-Tool. - Since vesion 1.42 there is a 'DGPS'-like tool: Two PPCs can be connected via WLAN. The 'server' is placed on a known coordinate and sends its aberration to a second PPC. With this tool SingulArch-Pocket is perhaps the most accurate GPS-solution for PPCs on the market. - There are tools helping you to create your own maps. - When you leave the borders of a map in GPS-mode, SingulArch-Pocket will try to load a fitting map on its own. - GPS-coordinates can be mapped and saved either as decimal coordinates (WGS84), UTM (without zone) or as Gauss-Krueger-coordinates. - import and export of Top50-map-overlays is possible. Thus SingulArch-Pocket can be used as simple navigation system (see pictures below). - GPS-data is drawn in the CAD-Tool and can be saved by button-click or in a free definable interval. - GPS-coordinates are stored in the same table as your coordinates from e.g. your totalstation. - SingulArch pocket and e.g. the Yakumo delta 300 GPS (260.- €) are a complete system for carrying out surveys of any kind. - Together with the GPS-function SingulArch-Pocket also is interesting for geologists, biologists and everybody else who wants to collect data "on the way". Do I really need SingulArch-Pocket? - Fieldwork causes hours of boring indoor-work and costs a lot of time and much money, if the lists, descriptions etc. must be put into databases, excel-sheets or text documents later on. - SingulArch-Pocket was designed as a database, which lets you collect all kinds of data from archaeological excavations or other projects in one program and at once, not later on! - users of the licensed version have to enter an password (there is an administrator- and user-password). The administrator may change, add and delete data records. Users are allowed to change and add but not delete. - users, who have no password may use SingulArch-Pocket as a project-viewer only. - your data is quite well protected from abuse this way. - saving your DB on memory cards once in a while offers you a maximum of security against loss of data. ... and view at once. - you can filter at will in all forms. The SQL-filter-statements can be stored and used again at any time. - different kinds of coordinate data can be imported into the DB. 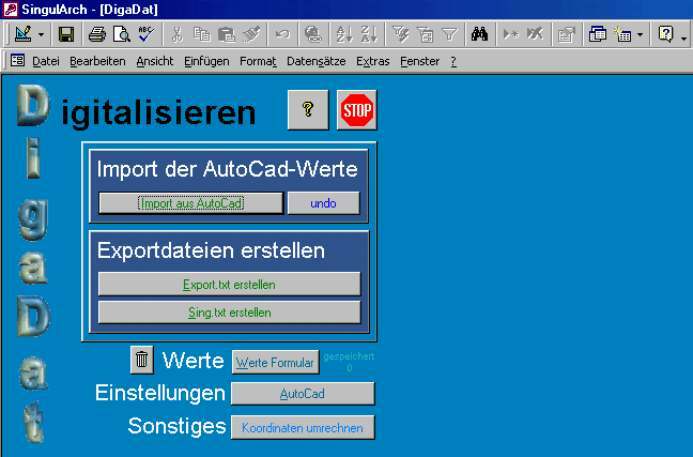 - you can also use SingulArch-Pocket, if you do not possess the (German only) Desktop version of SingulArch. - create reports (textfiles) out of your data and e.g. send it via infrared to a visitor whom you want to give detailed information. - you can convert desktop projects from SingulArch into pocket-projects and vice versa (see picture below). - numerous drop down fields, based on textfiles, help you to enter your data quickly. - the work with SingulArch-Pocket does not require a long training period. - in the CAD-tool you can filter, change, edit, convert and add coordinates via the graphic surface. - a SQL monitor is integrated. You can open every pocket ACCESS DB with SingulArch-Pocket. - pack your PPC into waterproof clip-bags. Your equipment will be protected this way. - no more running back and forth beetween notebook/desktop and e.g. finds: with SingulArch-Pocket you have all the data with you at any time. - easy controlling of finds, photos, papers etc. Where Is The Desktop-Version Better? - the MS ACCESS desktop-version has better report functions. Nevertheless SingulArch-Pocket lets you create reports as textfiles. - Creating scripts for AutoCad is the biggest difference between the two versions: with SingulArch-Pocket you can just create AutoCad-scripts or DXF-files which draw points and codes as text. The desktop-version creates complicated scripts - depending on the codes of the coordinates - with levellings, outlines of features, profiles etc. : Just look at some of the AutoCad-screenshots in the desktop-versions mainpage. Where Is The Pocket-Version Better? - SingulArch-Pocket has with its CAD-Tool an integrated graphical interface which helps you to handle your coordinates. - You can have SingulArch-Pocket always with you. PPCs' accumulators should last the whole day. - If you have got a PC 2002 you have to install service release I, otherwise there is an error message concerning Active X. - the EVB (Embedded Visual Basic Runtime; Download it from Microsoft for free) is necessary and no longer included in the standard distribution of PPCs. What Is The Difference Between The Demo and The Licensed Version? - you may not save with the demo-version. SingulArch-Pocket is like a project-viewer. - you also cannot save GPS-data but you are able to import Top50-overlays, so you can use the demo-version as a simple navigation system. Where Can I Get the Licensed Version And How Much Is It? - there is an order form for German Customers with the actual list of prices. - mail me if you come from outside of Germany and are interested in the licensed version. - I'm interested in your opinion. Let me know about errors, wrong translations etc. (e.g. via the feedback-form). characteristic: you cannot store data in the demo. For testing purpose there is an excavation of a late La Tène-settlement (Erding.cdb) attached. You have to copy this file into the folder \My documents \ to be able to load it. GPS will work in the demo-version but you may not save coordinates. what you need Pocket PC 2003 or Pocket PC 2002 with service release I installed. Legal: a commercial use of the demo version is not permitted! Note: I am not responsible for possible damage to your computers or file systems in connection with the installation and work with SingulArch pocket. EVB: perhaps you will also need the Embedded Visual Basic Runtime. Download it from Microsoft for free. Helpfiles: The helpfile is included in the demo-version. 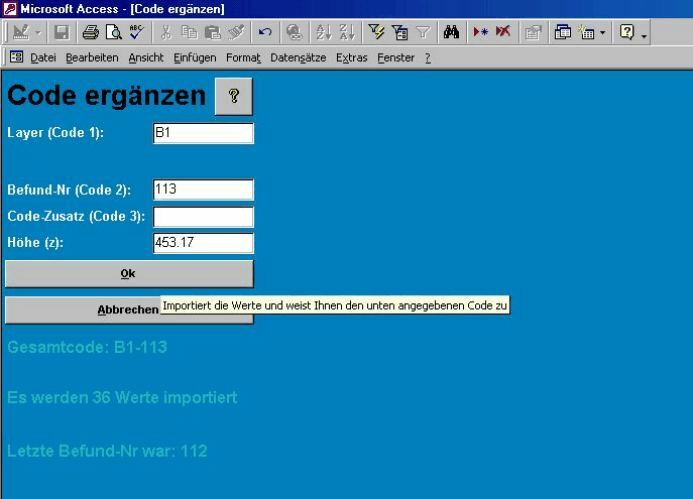 The German helpfile for the desktop-version (anleitung.zip) gives detailed information about the forms and e.g. coding of coordinates. New Projekt-DB: If you are already using Desktop-Projects of Version 6.2 you should replace the empty-project.cdb in your PPC (folder Programs\SingulArch-Pocket) with this file: empty-project.cdb (the field Anzahl in T_Fundzettel is now a textfield and no longer an integer number). Project: The file Eching.zip (1 MB) contains the database of an excavation that was carried out 2005. Prehestoric and carolingian Settlements with about 700 features were found in Eching, Landkreis Freising. In this workaround I describe a way how you can run Embedded Visula Basic programs (EVB) on your WM5-Device. Although it worked without any problems on my Fujitsu Siemens N560 you will have to try this workaround on your own risk. 6. Change the value of the registry-entry HKEY_LOCAL_MACHINE \ for Security \ Policies \ Policies \ 0000 1001 from 2 to 1. Most simply with the small program Rapi Securtity tester. Copy the EXE file to your PPC and start it. Select the option “Full ACCESS”. From now on EVB programs should run on your device and the conversion between CDB- and MDB-files should function as well. Please give me a feedback whether my workaround was useful for you. Check your settings in gps.txt (com-port, com-port-settings). If everything is correct and it still doesn't work, try a soft-reset. Sometimes GPS needs up to five minutes to start working. How do I have to code? How do I get lines? Coding of coordinates is the same than in the desktop-version of SingulArch. A coordinate has three differnet codes. Code1 defines the type of coordinate, Code2 is the (feature)-number, which you can filter in the CAD-tool very easily (must be an integer number), Code3 is an additional, optional letter. All coordinates with identical coding (all 3 Codes the same) will be drawn as lines; e.g. all coordinates with Code1 = PP, Code2 = 1 (, Code 3 = A) will be drawn as a line. Something special about Code1 = N1 und NU. Within the CAD-Tool their height can be.drawn as text. You will find more informations about coding in the german instructions to the desktop-version. Choose the angular coordinate-system when you start the CAD-Tool the next time, because the world-map is saved as WGS-file. Choose the WGS-Option in GPS-mode (button on the lower right side), before you load the map. Give me Feedback. I cannot solve problems that I don't know about.